First, what is conflict in a story and why does it matter? Conflict is opposition and struggle, whether between characters who have opposing goals, or between a character and their own inner demons. Sometimes conflict lies between characters and their environment (in adventure novels, for example). In an engrossing novel, conflict supplies tension. When an antagonist has opposing goals to a protagonist, we know only one can be victorious. This creates suspense as we wonder who will triumph and how. Conflict supplies the stakes and odds that create rising and falling action. If, for example, in Tolkien’s Lord of the Rings cycle Frodo’s quest to destroy the One Ring were simple and easy, the story would be predictable and boring. Smaller and greater skirmishes along Frodo’s way create lesser arcs of tension and release. Multiple conflicts of varying size give stories their unique shape and character. Conflict also is a crucible in which characters can grow and change. Through facing inner and/or external adversity, characters gain new insights and strengths. They overcome flaws or give in to them. Conflict is thus a key agent of change. This is the most common story conflict. Conflict may arise in every kind of relationship, from friction between a character and their overbearing parent to conflicts between heroes and villains. In her famous Harry Potter series, J.K. Rowling understood the importance of believable and well-motivated person vs person conflicts. From the start of the series, there are multiple conflicts between characters. The first book, Harry Potter and the Philosopher’s Stone (‘the Sorcerer’s Stone’ in the US edition) opens with Harry’s life with his abusive adoptive parents, his aunt and uncle. The Dursleys are emotionally abusive due to their fear of Harry’s latent magical abilities. Later, other conflicts emerge. There are various conflicts between students at Hogwarts. For example, Harry’s ongoing feud with fellow student Draco Malfoy, who is envious of Harry’s popularity and sporting talent. Besides showdowns with the series’ main villains, there are also conflicts between students and teachers, such as the severe potions teacher, Severus Snape. Early, background struggles to overcome. Harry’s fractious relationship with his aunt and uncle is present from the start. Rowling diversifies conflict effectively. There isn’t only friction between her main character and villain. Instead, conflict is everywhere in her magical and human worlds. Her conflicts fulfill multiple functions, from showing Harry’s difficult background to upping the series’ stakes. Person vs nature or environment is particularly common in survival stories. In some novels, such as Daniel Defoe’s castaway story Robinson Crusoe, person vs nature is the main conflict. In others, the standoff between a character or group and their environment is only part of the story. As mentioned in a previous post, Zora Neale Hurston’s novel Their Eyes were Watching God contains an excellent example of person vs nature conflict. In Hurston’s novel, the central character Janie elopes with a young drifter, Vergible ‘Teacake’ Woods, after two unhappy marriages. Yet the Okeechobee hurricane strikes and Vergible is bitten by a rabid dog while saving Janie from drowning in the resulting floods. 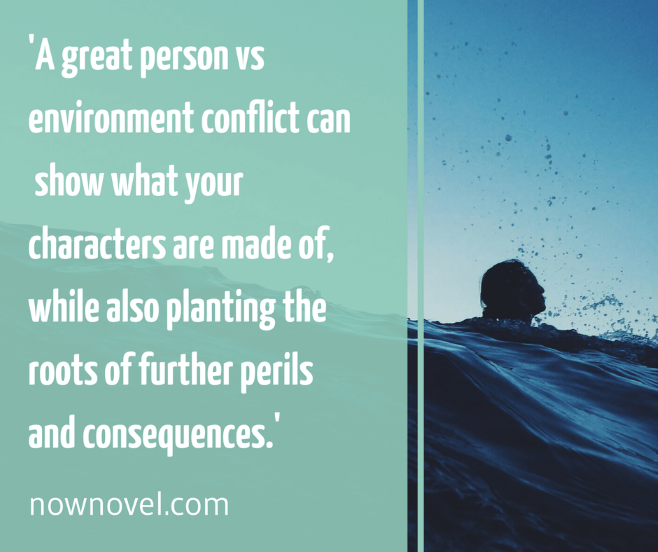 A great person vs environment conflict can thus show what your characters are made of, while also planting the roots of further perils and consequences. Internal conflict is another common type of story conflict. Emotions such as shame or jealousy are powerful motivators. Characters who have flaws, who struggle with some aspect of themselves, are intriguing. The primary conflict in Dostoevsky’s classic novel Crime and Punishment is internal. Early in the novel, the troubled and impoverished protagonist, Rodion Raskolnikov, murders a pawnbroker for cash. Dostoevsky builds Raskolnikov’s internal conflict throughout the book, from the build-up to the murder to his growing anxiety and unease in its wake. The author shows Raskolnikov as he tries to justify the murder to himself. The character has a theory that he is helping those who could fall prey to the pawnbroker’s exploitative lending terms. Despite his rationalizations, however, Raskolnikov also kills an unexpected witness who intrudes on the scene, the pawnbroker’s sister. She is ‘innocent’ (by his own warped standards), complicating his dilemma. His mental state deteriorates, as his conscience plagues him and he falls under increasing suspicion. This example of person vs self conflict is effective because Dostoevsky shows the consequences of his character giving in to his darker, more violent impulses. The author creates intense suspense as we wonder whether Raskolnikov will crack under pressure and turn himself over to the police or be caught. Other conflicts between characters emerge, but the protagonist’s inner struggle remains the driving force of the story. The conflict between an individual and their society, the ‘fish out of water’ story, is another popular source of friction in fiction. Often, these novels are satires that cast a critical eye on a society and its ethics and morals. A classic example is Nathaniel Hawthorne’s The Scarlet Letter. Through the words of individual spectators, Hawthorne shows the hypocrisy of the society in this conflict. The spectators shun and shame while failing to see the undignified element of their own cruel natures. We see that it is not so simple as the society being ‘right’ and the transgressor who breaks its rules being ‘wrong’. The person vs society conflict works because Hester’s individual transgression show the cracks in the values of society at large. Even while being self-righteous, the spectators refuse to see the flashes of ugliness, the ‘indecent’ lust for violence and others’ suffering in their own behaviour. 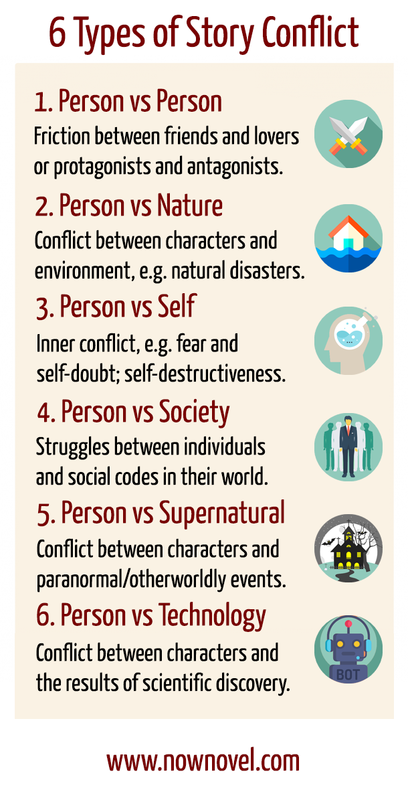 Person vs supernatural conflicts could fall under ‘person vs environment’. Yet the supernatural antagonist in a story may be a malevolent spirit with character-like personality, or a more abstract evil force. Stephen King is one of the great masters of the person vs supernatural story conflict. In his 1986 horror novel It, for example, a group of children is terrorised by a shape-shifting being that uses the fears and phobias of its victims to take its shape, most often a clown. One of the unique elements of of a supernatural conflict is that it can’t always be solved via natural, logical means. In horror novels, villains often return in different guises, or in the spirit world – the conflict (like It) can morph and transform. A supernatural antagonist like It thus gives the author the means for constant tension and suspense. Because It can take multiple forms, a web of suspicion grows. Every character, animal or object in the story becomes potentially dangerous. By making each of his child characters’ fears affect the form It takes, King multiplies the possible scenarios that can play out. The supernatural conflict is thus an excellent source of unrelenting suspense. ‘Person vs technology’ is a common feature of the science fiction genre, especially dystopian novels about innovation ‘taken too far.’ Stories about Artificial Intelligence turned malevolent, for example. Often Asimov uses these laws to show conflicts in human vs machine problem-solving. In ‘Runaround,’ for example, a robot named Speedy sent to collect fuel gets stuck in a loop running around the fuel source. The human characters who come across Speedy realise it behaves this way because the source is dangerous. To venture into the source would break the Third Law. Speedy has been ordered to do something, though, so not fetching the fuel would break the Second Law. The character Powell realises that he has to risk his own life to force the robot to achieve the task, since the First Law (not allowing humans to come to harm) will overrule the second two. The conflict is effective because it contains multiple sources of tension and suspense. On one hand, the robot, Speedy, has ‘internal conflict’ , since it can’t complete its vital task due to conflicting robot laws. The human characters, on the other hand, must resolve the internal conflict behind Speedy’s behaviour. It boils down to ‘human mind vs machine mind’. Asimov thus creates something more complex and nuanced than a simple ‘evil robots try to destroy humanity’ plot. Have an idea for a gripping conflict, a fascinating showdown? Join Now Novel and get helpful feedback on your story’s central struggles.